With an elevation of around 1800 ft, a steep southeast aspect, and weathered granite soils over 500,000 million years old, Ankida Ridge’s name is befitting its breathtaking splendor—“Ankida,” an ancient Sumerian word which means where heaven and earth join. It’s definitely one of the most stunning vineyards I’ve visited. 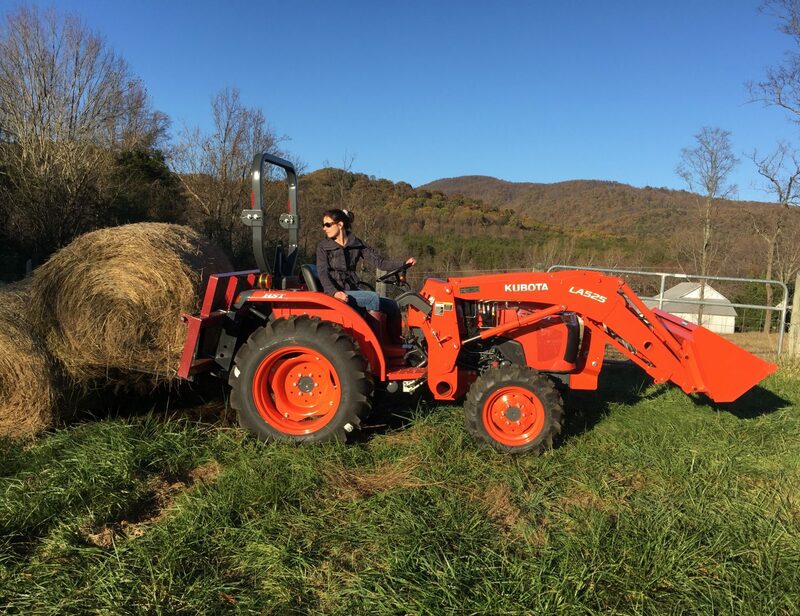 Located in the Blue Ridge Mountains of Amherst County, Virginia and owned by Christine and Dennis Vrooman, Ankida Ridge Vineyard has approximately six acres under vine on site. The plantings include: Pinot Noir–planted in 2008 & 2017; Chardonnay–planted in 2008 & 2017; and Gamay (think Beaujolais, and it loves growing in those granite soils)–planted 2017. These Burgundian-style wines are extremely limited in production, currently producing under 1000 cases. At Ankida Ridge Vineyard, the Vrooman’s have done their research and understand how climate, weather, topography, and soil impact a vineyard’s environment and expression of its fruit; thereby, affecting the grapes’ quality, taste, and structure as well as the wine itself. Special attention is given to matching the grape variety to its environment: kind of soil, slope and aspect to the sun, the continentality (difference between the hottest and coldest months), and the diurnal range (difference between daytime and nighttime temperatures). It is the steep slopes, southeast aspect (exposure to the sun), and granite soils that all work together to ripen the Chardonnay and Pinot Noir grapes during the daytime. And, the diurnal range that allows the cooler nighttime temperatures of this particularly high altitude to slow down the ripening process, helping to maintain acidity and freshness in the grapes. It is these factors that contribute to making an exceptional wine. The Vrooman’s believe that great wine is made in the vineyard, and the role of the winemaker is ” to be gentle in his/her approach, restrained, allowing the beauty of the well-cared for fruit to express itself in the bottle.” It’s due to this adherence of the utmost care in the vineyard and restraint in the cellar that make these wines so elegant and exciting. These efforts in the vineyard and cellar are certainly being noticed, and Ankida Ridge is receiving its share of attention. Their Pinot Noir was referred to by Richard Leahy, wine critic, author, and writer of “The Richard Leahy Report” as “the most remarkable Pinot Noir I’ve had from the Eastern U.S….” They were named “Top Ten Brands of 2017” by Wine Business Monthly; “A new and exciting producer” by Jancis Robinson; “a mouthwatering, multi-dimensional, mindset-mending demonstration of what’s possible in Virginia’s Blue Ridge” by David Schildknecht, eRobertParker.com; “a Virginia Pinot Noir that wowed the crowd” by Dave McIntyre of the Washington Post; and an “International Pinot Noir Celebration”(IPNC) Featured Winery in 2016.” Praise, indeed!! During our visit, Scott and I tried the Summer Tasting Menu. Among our favorites were the Ankida Ridge Sparkling Brut Blanc de Blancs 2015, Ankida Ridge Chardonnay 2015, and the Ankida Ridge Pinot Noir 2015. The Ankida Ridge Sparkling Brut Blanc de Blancs 2015 is 100% Chardonnay and is picked early to preserve acidity in the grapes. It’s made in the traditional Methode Champenoise style (second fermentation in the bottle); barrel aged in neutral French oak for 9 months, and bottle-aged for nearly 18 months before disgorgement, and has 12.2% ABV. This sparkling wine is pale gold in color with an aromatic medium (+) intensity. It has aromas of honeysuckle, lemon zest, green apple, green pear, wet stone, toast, and brioche. On the palate, it is dry with pronounced flavors of green pear, green apple, lemon zest, lemon juice, wet stone, toast, and brioche. It also has high acidity, medium body, medium alcohol, and a medium (+) finish. This sparkling wine is outstanding. The Ankida Ridge Chardonnay 2015 is aged in 10% new, 90% neutral French oak with 70% of the barrels undergoing malolactic fermentation (MLF)–contributing to its creaminess. This wine is aged sur lie (on dead yeast cells) for nine months, adding texture and freshness. This wine has 12% ABV. This wine is medium gold in color with an aromatic medium (+) intensity. It has aromas of ripe yellow apple, white peach, wet stone, blossom, honeysuckle, and a hint of buttered brioche and vanilla. On the palate, it has pronounced flavors of yellow apple, honeysuckle, lemon zest, white peach, yellow peach, grapefruit rind, honey, and a note of vanilla and brioche. It is dry (not sweet) with high acidity, medium (+) body, medium alcohol, and a very long finish. This wine is outstanding. The Ankida Ridge Pinot Noir 2015 is aged in 30% new French oak, 70% neutral French oak for ten months, and has 13% ABV. This wine is pale ruby in color with a medium aromatic intensity. It has aromas of red cherry, raspberry, strawberry, red currant, wet stone, wet leaves, mushrooms, tobacco and a hint of cranberry and vanilla. It’s dry with medium (+) acidity, medium tannins, medium body, and medium alcohol. It has wonderful red fruit flavors of raspberry, red currant, cranberry, and cherry as well as a lovely earthiness and minerality characterized by wet stone, mushroom, and wet leaves. It has a medium (+) finish. This wine is outstanding. I was so thrilled to discover Ankida Ridge Vineyard, a rising star in the constellation of vineyards and wineries in our area as well as the Eastern United States. With their stellar performances in the vineyard and cellar, Ankida Ridge is producing high quality, beautiful wines that really shine. I enthusiastically encourage visiting. You’ll enjoy exceptional Burgundian-style wines in the charming, rustic tasting room, or on the deck overlooking stunning views of the Blue Ridge Mountains. Either way, your experience will make you feel a little closer to heaven. You do!! It’s fantastic! We’re so excited to have finally discovered it. It’s only about an hour from Bedford county. And, well worth the scenic drive! Thank you, Ritu. The work they’re doing at this vineyard is really impressive and it shows in their wines. Wow! The vineyards in Virginia are truly producing excellent wines. I love your description of the land, and what grows great grapes. I’m so glad to hear the Virginia wine news. Best to you, Tonya! My pleasure! I will visit you again soon. Keep well.